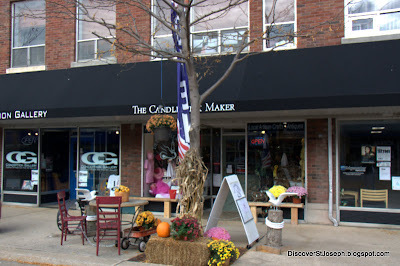 St Joseph has a butcher, a baker, and as of April 2011 they have a Candlestick Maker too. We have none other than owner and operator, Judi Benninghoff to thank for that. The Candlestick Maker shop is located at 408 State Street in downtown St Joseph, across the street from St Joseph Today. There is street parking available in front of the store or you can park in a free parking lot just a few doors south of the store. The first thing you'll notice when you enter the shop is a wonderful scent. That comes from the wide array of fragrances available for sale. There are many scented oils and scented candles... and holders and diffusers to display them. In addition to the scented items, The Candlestick Maker features a great selection of nautical decor items at very reasonable prices. What better place to grab a souvenir while you're visiting a Lake Michigan harbor town? It goes without saying that the shop also has "a little bit of this and a little bit of that" as well. Pottery, jewelry, seasonal decor, decorative signs, etc. There's pretty much something for everyone. 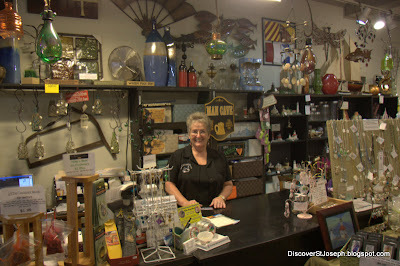 If you can't find what you're looking for, or would like gift suggestions, just ask Judi. She's a delightful lady to converse with and she truly enjoys being a shopkeeper. One of the best things about The Candlestick Maker shop is its hours. They are open 7 days a week and into the evenings, even after most of the other stores in downtown St Joseph have closed. It's so nice to have places around town to walk to after dinner. I wonder why more store owners aren't doing this. I found several items I couldn't resist taking home with me. I'll bet you'll find something to your liking too. Stop by today and say "hi" to Judi and help yourself to a free whiff of subtle and tranquil scents if nothing else! It truly is a delightful shop, Jasia. I have been in there myself and enjoyed all the scents and fragrances. Looks like a nice shop... not sure I've been by it as of yet. But I'll put it on our list. Hopefully we'll be out for the Friday Night event (11/18)and can drop by. Thanks for bringing it to our attention!